but if any of Jan’s contacts want to come contact Jan directly. Teri Young with Randal Muir, support Jan ‘Yarn’ Wositzky with Goose’s Bridle to end the night. Having just completed a hitch-hiking house concert tour from Brisbane to Melbourne (yes, really!) and delighted the crowds at the National Folk Festival in Canberra with the release of her second album, award-winning singer-songwriter Teri Young is set for two special shows – at Guildford and Lauriston. On tour with consummate jazz musician Randal Muir, Teri will be supported by a variety of local musical identities – uke band Goose’s Bridle, singer Fay White and storyteller/musician Jan ‘Yarn’ Wositzky. And that’s ‘supported’ in more ways than one, for both Fay and Jan, having heard and loved Teri’s songwriting have got together to help her put on these shows. 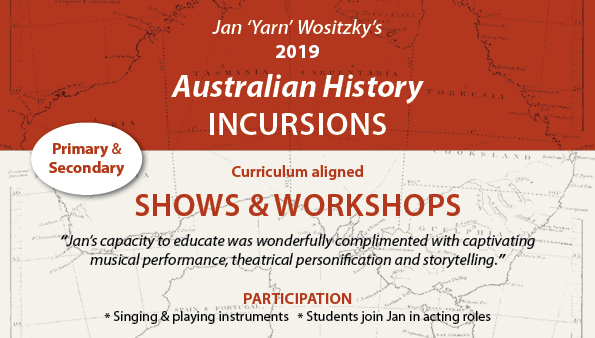 The word is from Fay and Jan that whilst Teri is relatively unknown around central Victoria that she’s a compelling, intimate performer and audiences should take a punt and go out to either Guildford or Lauriston out for a treat. Hailing from Tasmania, Teri Young’s poetry takes inspiration from ‘the island’. Many of her songs are situated in a particular time and place, and about everyday realities. She has a keen perception of the intricacies of human relationships – amongst families, lovers, friends, fellow community members – and sings about the stories that unfold between them. Her songs are romantic, political, poignant and funny, some groovy, some exquisitely graceful. Teri’s other vocation in life is nursing. She works on palliative care and general medical wards, finding the practical caring role to be a necessary spiritual balance to the bardic work of songwriting and performing. Teri’s musical partner, bassist Randal Muir, has been a professional jazz musician since the early 90s, collaborating with a huge variety of jazz, blues, soul and funk musicians from around the country as well as teaching accordion and piano at the Uni TAS Conservatorium. Randal’s jazz background and expressiveness of his improvised melodies and subtlety of his harmonic and rhythm ideas shines through in Teri’s folk style songs. At the Lauriston gig local ukulele champions Goose’s Bridle will end the night playing some fun music, with maybe even a dance. Jan ‘Yarn’ Wositzky is a banjo-weilding, folklore loving, story collecting treasure. He was one of the original members of The Bushwackers and has for over forty years been sharing melliflous flows of historic and less historic songs and stories, each painted in vivid detail and spiked with larrikin humour. We (Bill) Harney in a land where everything and nothing is black and white. Acclaimed storytelling theatre. In a land where everything and nothing is black and white, ‘Yarn’ Wositzky tracks the ‘expert’ on Aborigines, the greatest yarn spinner of them all, WE (Bill) Harney (1895-1962). The story of the white man who went black and came back. My show on this day is part of a larger event titled Stories on the Hill, all held in the Nowa Nowa Hall. winning book Dark Emu and his new book: Mrs Whitlam a children’s story of a beautiful Clydesdale. 7.00 – The Go Between: William Murrungurk Buckley – the white man who went black and came back. 9.00 – Supper and conversation – what these stories connecting stories mean today, with Jan, Bruce and Graham. For the first time in many years, storyteller, singer and musician Jan ‘Yarn’ Wositzky will be visiting southern Queensland, performing his renowned brand of solo shows, where every song turns into a storyabout smuggling taipans or an Indigenous dance, and the stories all segue into characters like WE (Bill) Harney, all laced with music on banjo, harmonica, bones spoons and bodhran, peppered with Jan’s anecdotes of getting into places like Kerry Packer’s house (but was Kerry home? ), and moving on to Turkish poetry of Gallipoli, with special material from Queenslanders such as Don Henderson as well as original and traditional Australian songs, all culled from a lifetime of travelling, listening and hanging out in the interesting places – such as Uluru for the 1985 handback – and much more, all strung together by a performer who just loves to entertain people. In all, it’s probably not worth missing. WE (Bill) Harney (1895-1962) in a land where everything and nothing is black and white. Text SMS: 0431 133 599 with name, quantity and type of tickets required. WHEN Saturday June 11 @ 7.00 for 7.30 pm start. Jan is calling a dance with the fabulous Willy Wagtails. WHERE House show in Campbell’s Creek. Location revealed when booking. WHEN Sunday May 22 @ 6 for 6.30 pm. Sausage sizzle @ 5.30. WHERE House concert in Canberra. Address given when booking. This exhibition attempts to share this most gallant Australian story through the eyes of artists Deb Fisher, Natalie Anderson, Ren Inei, Cricket Saleh, Viktor Cebergs and Shelley McKenzie. This major exhibition will explore and interpret each artist’s personal response to the William Buckley story. There is a limit of 35 seats so get in early! 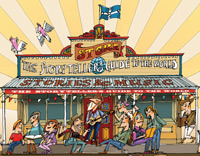 Story music theatre show re-telling Gallipoli with Turkish & Australian song, poetry and story. Show at 2pm in the church, with an 11am set of songs & stories on Main Stage. I am part of a songwriter’s gig, along with Kate Crowley, Lucy Wise, Loiusa Wise, David Hyams & Frank Jones – a wonderful line up! Theme for the night – ‘Out of Town’.